Many artists do not use music in their shows simply because they don not realize there is a reliable and invisible method for controlling music, without using a sound technician. Cue control offers solution for this problem and makes it possible for solo artist to add more variety to their shows. Axel Hecklau's system uses no fancy specially made electronic devices. With some clever ideas, an mp3-player and a standard wireless system (maybe you have this items already at home) you are able to manage your cues during the show by yourself - Reliably, Independently, and Invisibly. Your full concentration stays on your show, because you only have to push one button. 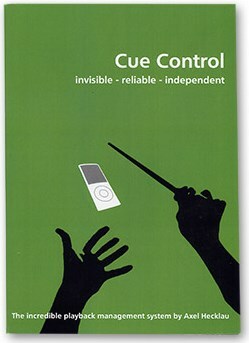 Axel Hecklau shares all his experiences of the past years in this script having used Cue Control in hundreds of shows. ...give it a try, it will certainly increase the quality of your performance.